AdStract(Leverage 226) | AdsWiki - Ad Network Listing, Reviews, Payment Proof & Advertising News. AdStract is a global video ad network, offering video advertising based on various pricing models. We offer quality service and superior solution for both advertisers and publishers by providing an effective and engaging way for viewers to interact with video. Our publishers enjoy valuable and high quality video content from top advertisers which includes viral videos, commercials, tutorials, educational, news content, movie trailers, and more. AdStract is the first global ad network that offers Pay-Per-View videos and performance based promotional videos, so publishers can choose the model that suits them best. Our advertisers can utilize our advanced video optimization platform that enables video distribution and monetization. We promote video ad campaigns through our video ad servers and third party players such as YouTube and Daily Motion. 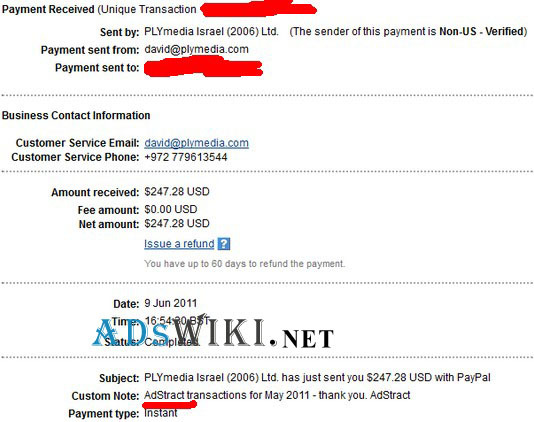 12 Responses to "AdStract(Leverage 226)"
PlyMedia/Adstract is a SCAM network. When you ask for payment, they will give you a payment date. When it passed with no payment, they will ignore your email. I reached 100$ since 2016/01 but still no payment till now. No any reply from the support and my account manager(Eugene Bregman). See my attached screenshot. Be aware of this scam network. Don’t worry. You must join MALTACPM Ad Network. No wait of payment……! You will loose your money. THEY ARE BIG SCAM. WE JUST LOST $4900. They will keep promising you that you will get paid soon and after few months when they see you can’t wait anymore, They just terminate your account. All Adk2 Exchange running sites are their own and set for fraud.